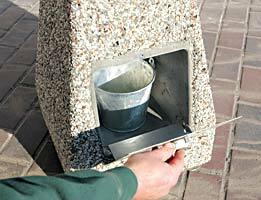 These concrete cigarette receptacles will help reduce unsightly cigarette waste outside of your facility. Constructed with steel reinforced concrete, these designer concrete smokers receptacles are long lasting, durable, and make maintenance a breeze. Simply open the stainless steel side panel door and empty the galvanized collection bucket. The concrete cigarette receptacles will easily withstand the toughest environments anywhere in the world. Galvanized waste bucket is included. 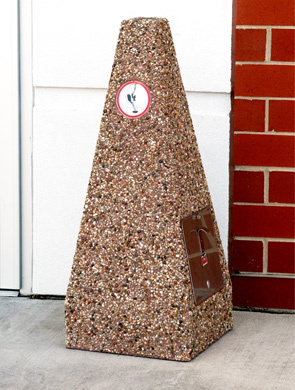 Cigarette receptacles are available in a variety of colors and both exposed aggregate and weatherstone concrete finishes.